Rinse cauliflower, remove the outer leaves, separate into florets and chop into smaller pieces. Process in a food processor in 2 batches, until “rice” texture forms (skip if using store-bought “rice”). Transfer cauliflower rice on a prepared baking sheet and bake for 15 mins. Line same baking sheet with new parchment paper or silicone mat (just make sure to scrape off any bits of cauliflower) and spray with cooking spray. 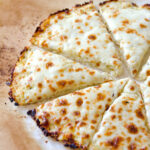 Transfer cauliflower pizza dough in the middle and flatten with your hands until thin pizza crust forms. Make it thicker that in my video, I made it a bit too thin. Bake for 20 minutes, carefully flip with spatula and bake for a few more minutes. Top cauliflower pizza base with your favourite toppings and bake again until cheese on top turns golden brown. You could cook cauliflower rice in a microwave (I just don’t have one) adjusting time according to your microwave’s abilities (they all differ).